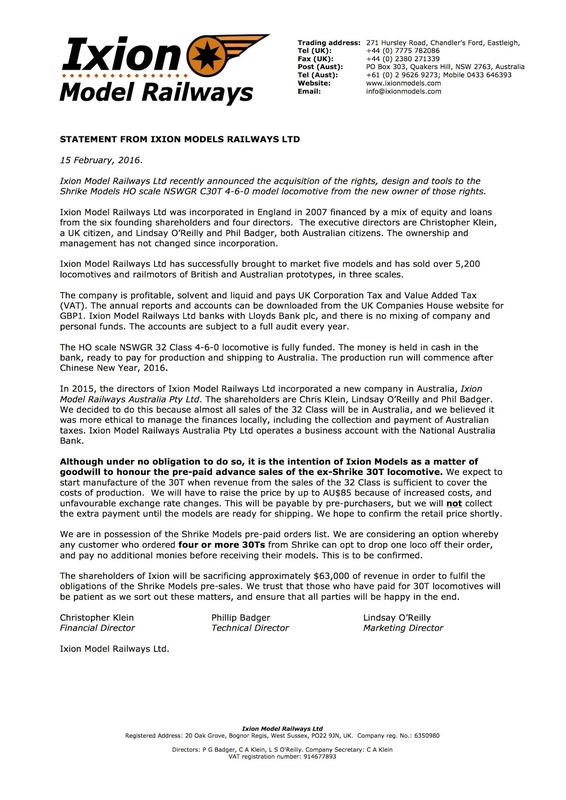 Ixion Model Railways Ltd recently announced the acquisition of the rights, design and tools to the Shrike Models HO scale NSWGR C30T 4-6-0 model locomotive from the new owner of those rights. Ixion Model Railways Ltd was incorporated in England in 2007 financed by a mix of equity and loans from the six founding shareholders and four directors. The executive directors are Christopher Klein, a UK citizen, and Lindsay O’Reilly and Phil Badger, both Australian citizens. The ownership and management has not changed since incorporation. Ixion Model Railways Ltd has successfully brought to market five models and has sold over 5,200 locomotives and railmotors of British and Australian prototypes, in three scales. The company is profitable, solvent and liquid and pays UK Corporation Tax and Value Added Tax (VAT). The annual reports and accounts can be downloaded from the UK Companies House website for GBP1. 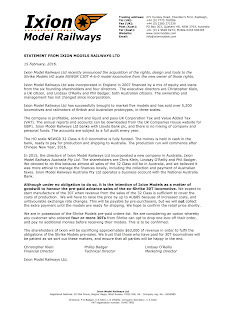 Ixion Model Railways Ltd banks with Lloyds Bank plc, and there is no mixing of company and personal funds. The accounts are subject to a full audit every year. The HO scale NSWGR 32 Class 4-6-0 locomotive is fully funded. The money is held in cash in the bank, ready to pay for production and shipping to Australia. The production run will commence after Chinese New Year, 2016. In 2015, the directors of Ixion Model Railways Ltd incorporated a new company in Australia, Ixion Model Railways Australia Pty Ltd. The shareholders are Chris Klein, Lindsay O’Reilly and Phil Badger. We decided to do this because almost all sales of the 32 Class will be in Australia, and we believed it was more ethical to manage the finances locally, including the collection and payment of Australian taxes. Ixion Model Railways Australia Pty Ltd operates a business account with the National Australia Bank. Although under no obligation to do so, it is the intention of Ixion Models as a matter of goodwill to honour the pre-paid advance sales of the ex-Shrike 30T locomotive. We expect to start manufacture of the 30T when revenue from the sales of the 32 Class is sufficient to cover the costs of production. We will have to raise the price by up to AU$85 because of increased costs, and unfavourable exchange rate changes. This will be payable by pre-purchasers, but we will not collect the extra payment until the models are ready for shipping. We hope to confirm the retail price shortly. We are in possession of the Shrike Models pre-paid orders list. We are considering an option whereby any customer who ordered four or more 30Ts from Shrike can opt to drop one loco off their order, and pay no additional monies before receiving their models. This is to be confirmed. The shareholders of Ixion will be sacrificing approximately $63,000 of revenue in order to fulfil the obligations of the Shrike Models pre-sales. We trust that those who have paid for 30T locomotives will be patient as we sort out these matters, and ensure that all parties will be happy in the end.